I don’t know about you but I think I’m finally feeling normal again after eating like a little piggie last week over the holiday. It’s hard to resist what’s in front of you when you love food right? My problem isn’t always the ‘choices’ that I make…it’s how much of the choice (good or bad!) that I eat! Portion control has never been a strength of mine. So this past Sunday, I declared this week to be ‘clean eating week’. When I talk about clean eating, I’m not talking about any type of diet per se…I’m talking about how I like to eat, which is as whole, natural and nutritious as possible. Basically, lots of fruits and veggies, whole grains, beans, water, and fish (or other lean proteins). It’s pretty straight forward really if you think about it, and nothing you haven’t heard before. After a few days of filling yourself up on the good stuff (and watching your portions of course), your body should be happy again. And yes, I’m resisting my coveted nightly glass of red wine this week…sigh. I made this chili in my slow cooker a couple of weeks ago and thankfully froze a few portions in tupperware. Soup and chili can be such saviors when you’re really trying to watch what you eat. It’s a cinch to put together and you can pretty much cram as many veggies as you can tolerate in one batch. 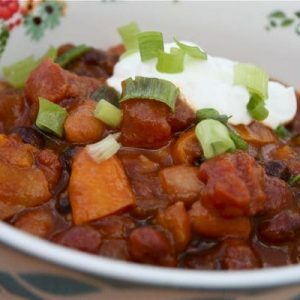 I loved this chili made with pumpkin, it was different and what made it even better for me was the dollop of Greek yogurt (or sour cream) at the end. It gave it the perfect creamy texture and flavor. My husband wasn’t such a fan of this chili, he couldn’t get over the pumpkin factor…and he also insisted on skipping the essential dollop of cream at the end…oh well, more for me in the freezer! Add garlic and olive oil to slow cooker and turn on high while you are chopping your vegetables. Add all ingredients to slow cooker and stir to combine. Place lid on tightly and cook for 4-5 hours or until heated through. 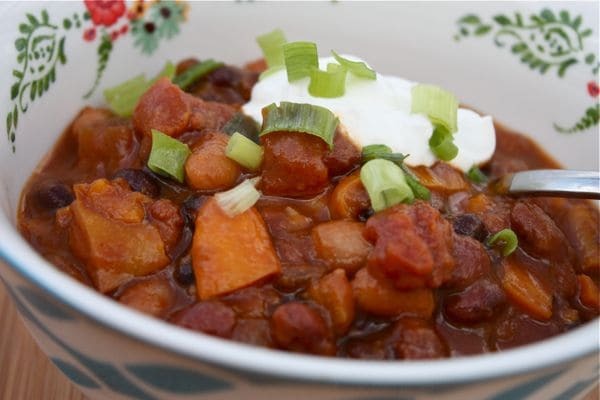 Serve chili with a dollop of Greek yogurt or sour cream for a creamy finish…highly recommend it! I’m with YOU. I’ve not had anything to drink since Saturday night. But I just bought our tree/decorations today….so that might have to change for tonight. IT’S FESTIVE. This chili makes me tremble. I need it. 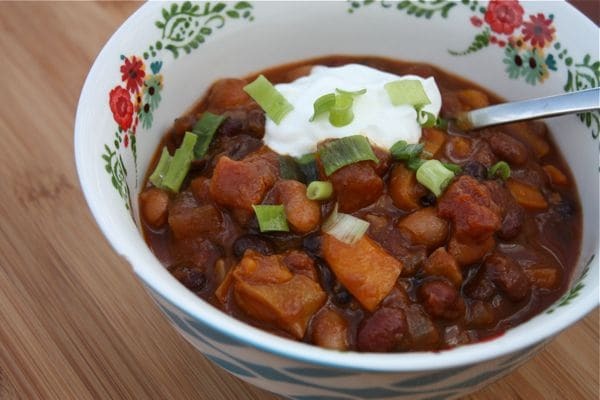 I love the idea of Greek yogurt with this type of Chili! I’m feeling pretty normal, normal enough for a bowl of this. It sounds so hearty. I love vegetarian chili! I have been eating clean this week too! Looks great! I have pumpkin chili on my menu for next week! How could the man not love this? Looks yummmyyy! I’m feeling the need to detox, too, and this sounds like the perfect way to kick start some healthy eating!! This looks great! And soooo easy, I’m on it! There looks like a piece of sweet potato in there? Also, I did a whole post on my chipped bowls. It’s what makes them happy :o) go with it! Awesome recipe! I would definitely go with my favorite, black beans. And then red kidneys and pintos. I love that this is packed with so many veggies. Perfect for satisfying, healthy eating. That glass of red wine in the evening has started to be my treat for a day of clean eating. I’ll toast to you. Pumpkin chili is our favorite – I love the smooth, creamy texture it gives! Pumpkin and beans are so good together! I could go for a bowl of this, it’s chilly here today! The temp has dropped dramatically the last couple of days and it’s time for my winter coat and a hot dinner. I love the addition of the pumpkin! I’m not sure how I missed this yesterday but it looks perfect! Love warm comfort food this time of year. I’m all for eating light and clean this time of year – love how healthy this chili is. I haven’t tried pumpkin in chili yet, but it sounds like it adds some nice flavor and texture. It is chilly here and I would love a big bowl of this for lunch! Oh my goodness, this sounds fantastic! I wish that I had seen this recipe earlier so that I could have it for dinner tonight! I saw this recipie a few months ago and bookmarked it and just on a whim decided to make it today. Let me tell you it was AWESOME! I had to pry myself away from the crock pot in order to save some for this weeks dinner at work. Both my stomach and I thank you for posting this! Mike, thank you for letting me know! I’m so glad you enjoyed it! i just used this recipe, and I wondered: Why in the photo does it look like chunks of pumpkin, but only the canned in the recipe? Sooooo, since i had a small pumpkin that came in our farm share… I cubed that up, and sauted the onions peppers garlic, til soft, then added the pumpkin cubes and browned it up a bit for flavor, and then made the recipe but did it on the stovetop. Adds a nice chunky feel to a nice recipe. Great idea adding pumpkin chunks! The chunks of pumpkin you see in the pics are actually the bell peppers (orange and yellow!) and sweet potatoes! Such a great fall soup. Thanks so much for sharing your version!